A week removed from my half marathon, and I'm finally getting to the nitty-gritty recap! It's been a busy week, yes, but also a surreal one. I'm still sort of in a bit of shock that I did it. With my weight loss slowing and the stress of impending unemployment, I decided to make a fitness goal to keep my mind and my body in good shape: I wanted to weigh 173 pounds (half my starting weight) when I ran the Chicago Half Marathon in September. I figured that if something came up and I couldn't race that day, all the training wouldn't have been for nothing: I'd still have lost weight and kept active during such an incredibly stressful period of my life. Up to that point, my longest run had been around 6.5 miles; my longest race was a 10K in June. About a month and a half later, I was up to a 9 mile long run when my employment issue was resolved: I landed my absolute dream job ... at a university in California. The transition was very fast, though, and not without difficulties. I moved, and I essentially stopped running. The weather was very different from Chicago - still in the 90ºs into October! - and with all the stress of being a new faculty member in a new town in a state I'd never even visited before, let alone considered residing in, I put running on the back burner entirely. Not even the purchase of the Garmin Forerunner 305 I'd been lusting over for months was enough to inspire me to get back out there. There were two major events that got me back in my running shoes. In the beginning of October, I got a message on Twitter from Ann asking if I'd seen a documentary called "Spirit of the Marathon." It follows several people as they train for the Chicago Marathon. It was available to stream via Netflix, and I sat there on my couch, sobbing as I watched it. That used to be me. I used to be a runner. Five days later, the Chicago Marathon took place, and I woke up ridiculously early to watch the live streaming coverage online. More tears, but this time, none were based in regret. I was flooded with memories - remembering all of a sudden just how much loved to run, how much I enjoyed racing, and how much I loved pushing myself to meet my fitness goals. I felt motivated, and I went and registered for a half marathon in Los Angeles a few months later. I laced up my shoes, suited up, and went for a 2 mile run. Making my training schedule was tough. I had been up to a 9 mile run in Chicago, but I knew that nearly a month and a half off had really affected my endurance. I planned long runs for Sundays, starting with a 2 miler and adding another mile every week, with a few weeks at the end where I added half miles. Then during the week, 2-4 mile runs on Tuesdays and 2.5-5 mile runs on Thursdays - those days were for speed work. Sundays, I don't care if I'm logging 20 minute miles - it's all about distance. About one month before the race, I ran my first double digit run. It was an incredible triumph - my longest run ever, Chicago runs included. I was as proud that day as I was at the finish line of every race I'd ever ran - I stopped running, struggled to get back to the point where I was, and now here I was ... surpassing it. Training continued to go well, and one of my proudest runs was an 11 miler back in Connecticut. My holiday/family-related emotional eating had me feeling defeated, but I still got out there and knocked out a great long run along Long Island Sound and several beaches of the Connecticut shoreline. About a week and a half before the race, I went to San Francisco with Matt. Technically they were both rest days since I didn't run, bike, or do any formal working out, but I certainly did a ton of walking, much of which was up and down hills. The town I live in is incredibly flat, so it was quite a difference from what I'm used to. My last run was a scheduled 12 miles one week before race day. I got to about 7.5 miles when I started to feel a pain in my right heel. I slowed down, and took a 15 second break at 8 miles. I kept going, but at 10 miles, I stopped entirely. I sat on a bench and tried to work the muscles. It didn't feel like a muscle pain, though - possibly the tendon. After a couple of minutes, I got up to keep running the last 2 miles. I lasted 17 seconds before I had to call it quits. I slowly walked home, took an ice bath, and rested for the rest of the day (and all of the next day). My taper runs for the week were 3 miles on Tuesday and 5 miles on Thursday. I made sure to start extra slow and only push myself if I felt it wouldn't be harmful - and both runs were great, with absolutely no pain. I was pretty sure Sunday had been a fluke, my body continuing to recover from the hills in San Francisco. Still, I was concerned. On race day, I'd be running 13+ miles, and my longest long run was only 11 miles. I took a train down to Los Angeles, which gave me a lot of time to rest my legs and get ready for the next day. I went to the expo to pick up my race bib and packet, then headed to check into my hotel in Marina del Rey - one of the race's suggested hotels. 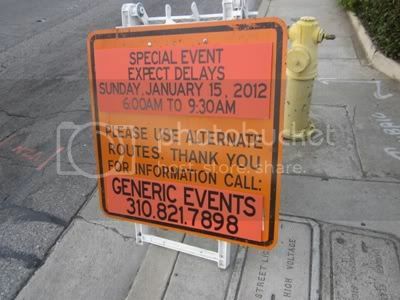 It was very close to the race site, which I appreciated because I'm not familiar with the Los Angeles area at all. No worries about getting lost or dealing with cabs and any race morning traffic - I wanted everything to be as easy as possible, and it certainly was. I walked for a couple of miles that day: to the train station in the morning, from the expo site to my hotel, and then from the hotel to the Subway a block away for dinner (lots of great restaurants in the area, but didn't want to risk something unfamiliar before the race). I had my usual: turkey on wheat, no cheese, no dressings, and lots of veggies. To be honest, I was excited, nervous, scared, and therefore I slept about 45 minutes the night before the race. I woke up, ate a banana and a single-serve packet of peanut butter, and headed to the race site. It was still dark and a little chilly, but it was terribly exciting. The race was a point-to-point race, meaning it didn't start and end in the same place. But again, I'm entirely unaware of the Los Angeles area, so I kind of appreciated the opportunity to see a bit more of the beachfront. The only downside to not knowing the area is not knowing how far you have left to go, but (a) there were mile markers in place all along the route and (b) I had my Garmin on, so no worries. I just ran, and enjoyed the moment as much as possible. I wasn't sure if I was going to run au naturel - that is, without any music - but decided to wear my iPod at the last minute. I was really glad I did, for a few reasons. First, because I was there entirely alone, and it was nice to have something familiar there with me. But also, because nothing makes me move faster than a well placed song. The race itself was great - a mostly flat course, with the exception of one mildly difficult hill at the turnaround. Miles 8.5-9.5 were uphill, 9.5-10.5 were back down. The other tough part was during miles 8-8.5/10.5-11, when we went past a really unfortunately located sewage treatment plant. Not at all what I wanted to smell at that moment. I kept up a great pace for the first 7 miles, when the first bit of tiredness in my legs kicked in, and I wondered if I'd be able to finish. I pushed forward, and got through the next 3 miles (hill and all) without any issues. Undoubtedly, the toughest mile for me was 10. I'm not sure what happened - maybe coming off the hill, maybe the sewage smell, maybe general exhaustion, or likely a combination of all of it - but it felt incredibly tough, and I slowed down a lot. There was a band playing music at the 11 mile mark and some folks cheering us on, and that definitely helped me perk up. The last fuel station was at mile 12, and the volunteers handing out water and Gatorade were cheering us on: you're doing great!, they said, almost done! Finish line is just at those palm trees! We're running along the beach, kid - there are [bleep]ing palm trees everywhere! But I kept going, and definitely got my second wind as I pushed forth to the finish. When I passed the 13 mile marker, the finish line was in sight, and the tears started. I thought about how I almost quit running. I thought about the first race I ran, just about one year earlier. I thought about myself, at 345 pounds, exhausted by walking from my bedroom to my bathroom. And there I was, a fraction of a mile away from becoming a half marathoner. The announcer called out my name as I crossed the finish line, and I threw my fists in the air. A volunteer handed me my medal, and I kissed it and cried as I walked down the beach to rest my legs. I walked over to the post-race party, drank some water and ate a mini Clif Mojo bar - there were food trucks there, but all for purchase. It seemed really odd that there weren't any bagels or pieces of fruit for racers - even 5Ks have that. I walked around and looked at the booths, then bought a vegetarian breakfast burrito from the Gardein truck, and took the shuttle back to the hotel to shower and let everyone know I had finished. So, lessons I learned from my first half? I know I definitely need to get better about fueling during my training runs. I don't usually fuel during a run at all - lots of water the day before, a good breakfast about an hour before the run, and then more water and lunch when I get home. But I could feel during this race that I needed something to push me a little, and as nervous as I was about doing something new/unusual during a run, I know I wouldn't have been able to do as well without it. I had water/Gatorade at miles 6 and 12, and a Clif gel shot at miles 4 and 8. I noticed the shots were about 100 calories each; since the race burned about 2100 calories for me, I absolutely needed the energy. I also was incredibly grateful for investing in a Garmin. 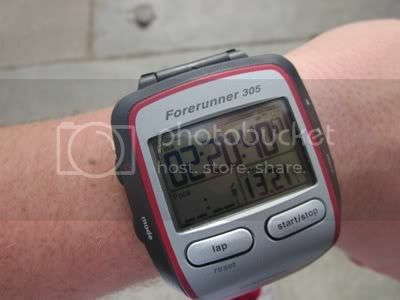 This was the first time that I raced with it, and I loved being able to keep track of my pace while I ran. I was aiming for 10-12 minute miles, increasing or decreasing speed as I felt necessary. But listening to my body, I felt most comfortable keeping myself between 10:30 and 10:45. I slowed down during that tough 10th mile, but another perk of being able to know my pace/time was being able to stay calm. That stretch was tough, but I could see that even if I went up to 13-15 minute miles, I'd make the goal I announced to everyone (2:30-2:45), and if I kept it at 10-12 minute miles, I'd make the secret goal I set for myself (2:20). I officially finished in 2:20:35, and couldn't be more pleased with my splits. I'm quite proud of the consistency - I tend to get overexcited and start fast, then have to slow down in order to finish. Though, there certainly were excited moments when I went a little faster - see the 7.3 and 7.4 mph top speeds in Laps 4 and 13? Lady Gaga is to thank for those. P-P-Poker Face. So, there it is. 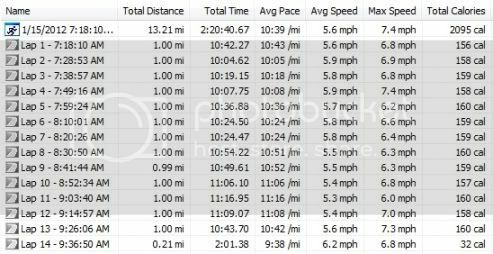 My first half marathon, the exceptionally long and detailed recap. 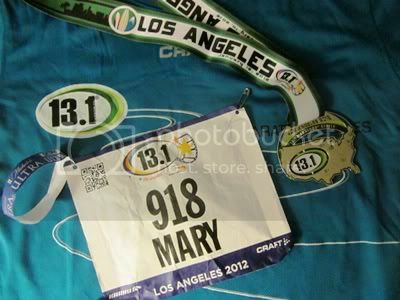 No, I didn't make my initial weight loss goal - I wasn't "half of Mary" at the half marathon. But it was still an incredible accomplishment, and I loved every single second of it. I can't wait to do another! WHOOT Hoot!!! You go girl!!!!! I cannot say often enough how PROUD I am of you. You provide inspiration for me on this journey. I started running after I read your blog. On New Years Eve I did my first run. I hope to continue the journey and provide inspiration to others as you have provided to me. Congratulations and keep reaching for your goals. Love, love, LOVED this recap!!!! I am SOOOOOO proud of you, Mary!!!! The finish line portion... made. me. sob. I don't know you (I haven't even been reading your blog very long) but I feel so SO proud of you! I hope that I can have this accomplishment for myself one day too! You go girl!!! Reading this gave me chills! You made your personal goal and you pushed yourself to the end. You are truly inspirational. Keep up the good work and your weight goal will surely be coming around the corner! Keep it up! I absolutely love your blog! It was an incredible accomplishment!! Good job, you are a true inspiration! That is so incredible. I'm so happy for you, proud of you, and inspired by you. I am in awe of what you've accomplished. Congratulations! That was a great recap Mary. You did an awesome job on the race. 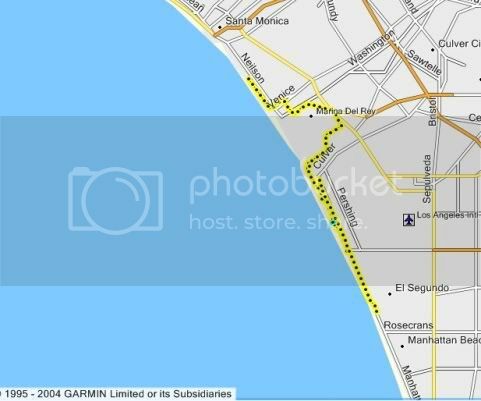 My husband does his first half marathon on feb 5th in Huntington Beach. It's so great that you did it on your own. What happen to Justin? I haven't heard you talk about him lately. Anyway, keep up the good work. Congratulations, Mary! That was incredible, and I'm so glad that you shared that with us. I am SO PROUD OF YOU!!! I am not a runner, but I used to volunteer for the Marine Corps Marathon every year because my hotel, where I worked, was full up with participants. The reason I tell you this is because these folks were carb crazy the night before the race. Pasta, pasta, pasta! We served a lot of pasta and had all the local Italian places on speed dial. I know you watch what you eat to keep your weight in check, but I was incredibly surprised at how little you ate before your half. A turkey sandwich? Wow, that is so little fuel, you did amazing on that. Anyway, perhaps you could ask other runners or do a little research, because I think at the rate/amount you run you need a better intake of calories/fuel to keep you going. What an accomplishment! So so proud of you. I see how far you have come & I want you to know that you inspire those of us who think we can't do it. I can't do it now but I will one day. Really glad you wrote such a full post, really brings it all together. You're amazing!